The New York Times presented on Saturday a close look at the Cupertino, Calif., company's move toward foreign production. The article was based on more than three dozen interviews with current and former Apple employees and contractors, as well as talks with "economists, manufacturing experts, international trade specialists, technology analysts, academic researchers, employees at Apples suppliers, competitors and corporate partners, and government officials." According to the report, Apple holds a "central conviction" that overseas production facilities offer scale, flexibility, diligence and skilled workers that U.S. factories are no longer able to match. Authors Charles Duhigg and Keith Bradsher related an anecdote from a dinner last February with President Barack Obama, Apple co-founder Steve Jobs, and several other tech luminaries. Obama reportedly asked Jobs why Apple is unable to to bring is manufacturing back to the U.S.
A guest at the dinner noted that Jobs candidly replied, "Those jobs aren't coming back." Though Apple employs 43,000 people in the U.S., twice as many as it does overseas, some have criticized the company for not creating more jobs in its home country. The report noted that an additional 700,000 people work on Apple's products via the company's network of contractors, but most of them are located outside of the U.S.
Apples an example of why its so hard to create middle-class jobs in the U.S. now, said Jared Bernstein, a former economic adviser to the White House. 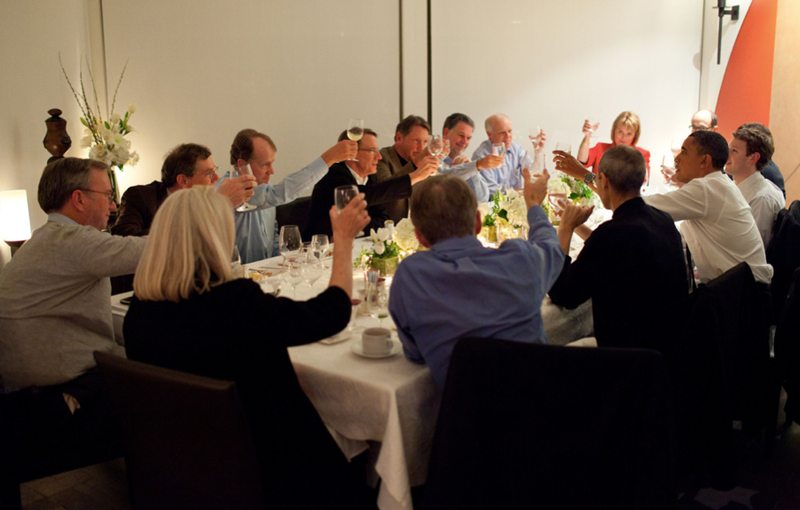 Jobs and President Obama at a dinner last year. But, the company's executives have indicated that moving work overseas is their only option. A former executive recounted an instance prior to the launch of the original iPhone where 8,000 employees were woken up in the middle of the night to begin outfitting glass screens, a last-minute addition for the handset. Within just a few days, the factory was producing more than 10,000 iPhones a day. Sources revealed that the last-minute adjustment came about because Jobs demanded a change in the iPhone just weeks before its scheduled launch. He had reportedly noticed that the keys in his pockets had scratched a prototype device he had been testing. One Apple executive left the meeting and quickly booked a flight to Shenzhen, China to address the issue, according to the report. But, others took issue with the claim, noting that workers with the mid-level skills required for factory work are in short supply in the U.S.
One Apple executive defended Apple's decision to produce iPhones overseas by noting that the device is sold in more than a hundred countries. We dont have an obligation to solve Americas problems. Our only obligation is making the best product possible, the executive said. The company did, however, used to pride itself on making its products at home. For instance, Jobs told the Times in 1984 that the first Macintosh was "a machine that is made in America." Tim Cook, Apple's former chief operations officer and current chief executive officer, has been credited with developing Apple's overseas supply chain. One former high-ranking executive said that Cook decided to move much of its manufacturing to Asia because it can "scale up and down faster" and "Asian supply chains have surpassed what's in the U.S."
Apple manufacturing partner Foxconn has risen to become a giant in the industry. The company is estimated to assemble 40 percent of the world's consumer electronics. "Apples executives had estimated that about 8,700 industrial engineers were needed to oversee and guide the 200,000 assembly-line workers eventually involved in manufacturing iPhones," the report read. The effort took just 15 days in China, compared to estimates by Apple's analysts that it would take nine months to find the necessary workers in the U.S.
Economists expect that the U.S. economy will adapt and find a way to replace some of the middle-class jobs it has lost overseas, but they warn that some workers, especially older ones, could be left behind during the transition. For its part, Apple has lobbied the government to allow a tax holiday that would allow it and other American corporations to bring home overseas cash. The WIN America lobbying group, which Apple supports, argues that doing so would allow the companies to create more jobs in the U.S. Two-thirds of the iPhone maker's $81 billion cash hoard is currently located overseas.